Gift Certificates & Discounts - Miaaaam! A special occasion deserves a unique gift. Anniversary, Birthday, Graduation, X-mas, etc. 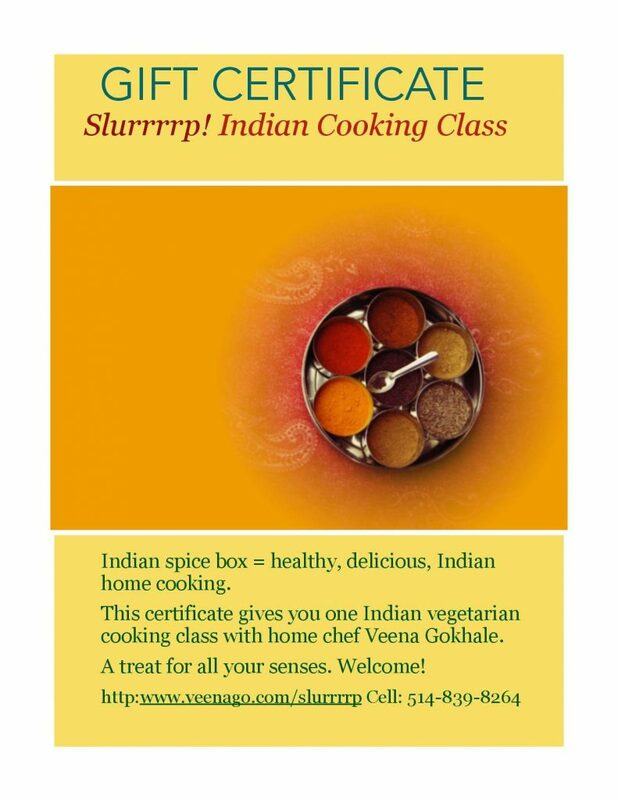 Gift a Slurrrrp cooking class. $70 for a private class at my home (steps from Metro Papineau station) or $50 to join a scheduled group class. In the 3-hour class we will cook 3 veggie dishes & enjoy a meal, with a conversation and cultural exchange. Detailed recipes and a list of where to buy Indian ingredients provided. CHECK OUT THE MENUS. And Options. Pay by PayPal, interac e-transfer or even cheque. I can send you the gift certificate by e-mail, if you like. In any case your payment is proof of purchase. Please contact me if you have any questions. And please note Slurrrrp discounts! FOR GROUP CLASSES ONLY.